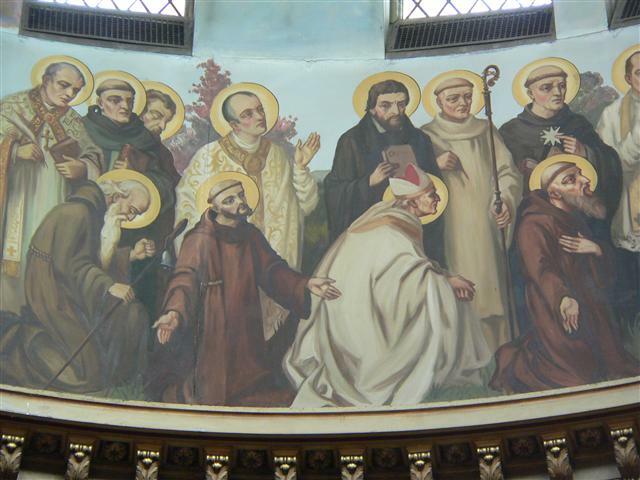 St. Alphonsus Liguori (1695-1787) and St. Ignatius of Loyola (1491-1556), whose feastdays we celebrate this week, are both depicted in a in a group of twelve figures identified as “Monks, Hermits, and Religious” in the dome of our church. St. Alphonsus, the first standing figure on the left, is pictured with a pen and book. Although he acquired fame as a writer, the founder of the Redemptorist Congregation is also remembered for his preaching and pastoral reforms. His feast is celebrated on August 1. St. Ignatius, fourth from the left (standing), was on his way to military fame before a debilitating war injury. His conversion experience began during his convalescence, and his writings during that time culminated in his greatest work, the Spiritual Exercises. Founder of the Jesuits, his feastday is July 31. The dome painting is by Buffalo-born artist Joseph Mazur; the photo by Gary Kelley. Thursday, August 1 ~ at 8:00 p.m ~ Bingo will be played in St. Charles Hall. Saturday, August 3 at 8:00 p.m ~ Bingo will be played in St. Charles Hall. We now have: Red, White & Blue; carry over Bonus Ball; and a progressive Share-the-Wealth! To check the carry over amounts and progressive numbers for this week, click HERE and visit our Facebook page. Monday, July 29 ~ St. Martha ~ Communion Service at 11 a.m.
Summer in the City, Sunday August 4, 12 Noon – 4:00 p.m. ~ Our host, SS. Columba-Brigid, requests volunteers from our cluster parishes to work one hour shifts at various stations/jobs during the party. By sharing the work everyone can enjoy the day. There is a Sign-Up Sheet listing the tasks that need to be staffed on the altar railing near Mary’s shrine. Note: Men are needed for set-up on Saturday, August 3; please sign up by Sunday, July 28. Thank you. Dan Korchowsky is serving as Blessed Trinity’s volunteer coordinator and can answer questions you may have. Our parish will host a dessert tent during Summer in the City. We need your homemade desserts and your help staffing the tent during the afternoon. A Sign-Up Sheet is posted. Please, no refrigerated desserts or layer cakes. The desserts will be cut and apportioned into single serve plastic containers before we transport them to the party. You can deliver your dessert on Saturday, August 3, at the 4:30 PM Mass (to the sacristy) or before the 10 AM Mass on Sunday, August 4(to St. Charles Hall). Please sign up by July 28. Amy Johnson is coordinating our dessert tent challenge. Thank you to all who can help in any way. We hope to see you at Summer in the City. Project Homeless Connect ~ As a way of showing homeless people and families that the community is aware of and cares for them, we are collecting deodorants for the Personal Items Bags that they will receive on September 5 at the 5th Annual Project Homeless Connect Day at the Buffalo Niagara Convention Center. Baskets for your donations are at each end of the altar railing and will remain through the weekend of August 3/4. We thank Sister Claire Edwards, Daughter of Charity from Sisters Hospital, and our Parish Council for bringing this worthwhile project to our attention, and we thank you for your generous cooperation!!! The Buffalo Public School System has extended the deadline to transfer a child within the District until Wednesday, July 31. If you need an application form for transfer to a school in good standing, call Sister Barbara at the parish office, 716-833-0301. An Invitation from Bishop Malone ~ To all couples who celebrate their 50th, 60th or 70th Anniversaries of Marriage in 2013 – You are invited to a special Mass in St. Joseph Cathedral on Sunday, October 27, 2013 at 3:00 p.m. On this day the entire Diocese of Buffalo will join those celebrating in their joy and gratitude to God, who has set them among us as a sign of His constant and faithful love. During the Mass, couples will renew their marriage vows. A reception will follow at the Adam’s Mark Hotel. In early fall we will be receiving registration information for this event. Seeking Employment? ~ Are you or someone you know an out of work job seeker? Facing the challenge of being unemployed and working through this tough economy is tough enough. You don’t have to go it alone. Contact your Office of Family Life Ministries for your FREE packet containing practical resources, prayers, scripture support and programs designed to support you on your journey. Just call us at 716-847-2210 or email familylife [at] buffalodiocese [dot] org. Know we care. Sisters of St. Mary of Namur celebrate 150th Jubilee Year in North America ~ Alumnae/Alumni of the Sisters of St. Mary of Namur and friends from the Buffalo Parishes are invited to join together in celebration of the order’s North American founding in 1863. Mass at Mount St. Mary Auditorium (3756 Delaware Avenue in Kenmore) Thursday, August 15, 2013 at 4:30 p.m. Picnic following Mass 6:00-8:00 p.m. Reservations are required and are due by July 31. The Picnic reservation is priced at $20 person includes dinner provided by BW’s Barbecue. For additional details please contact Alexandra Kogler Fussell at Mount St. Mary Academy,(716) 877-1358 extension 414 or afussell [at] msmacademy [dot] org. Meals on Wheels for Western New York needs more volunteers to help feed the growing number of homebound elderly and disabled individuals in Erie County. It’s easy to volunteer and takes just 60 minutes a day. Individuals 16 years of age or older can volunteer once a month, once a week or even everyday. Meals on Wheels needs both servers and drivers. To learn more about volunteering, call 716-822-2002, ext. 21. Compeer for Senior Citizens ~ Become a caring friend to a senior. Compeer volunteers demonstrate that friendly encouragement and caring support can truly enrich a lonely life. So often many seniors lose many of their longstanding relationships that they have counted on for years. Family moves, friends pass away, neighbors change. Struggling with loneliness and isolation they often lack the supportive friendships that so many of us take for granted. Currently over 80 volunteers are making a huge difference, but there are also 65 seniors throughout Erie County waiting for a friend. Contact 716-883-3331 or email staff [at] compeerbuffalo [dot] org. Mount St. Mary Academy will host its third annual Summer Music Festival on Saturday, August 24, 12 noon – 8 p.m. at Mount St. Mary Academy (3756 Delaware Avenue in Kenmore). Musical performances by: Mount St. Mary Academy Jazz Ensemble, JJ Swing and Mount St. Mary Academy Marching Band. Additional events include: car show, craft show, flea market, fashion show, pizza taste off, wine tasting, beer tent, meat raffle, food tent, bounce houses, Chivetta’s Chicken BBQ, and Theme Tray Raffles. Admission to the festival is free. (Please bring a lawn chair or blanket).